The KETEP process is a reproducible formula. It creates a text by combining a well-known tale with an environmental problem to be performed in an enjoyable and accessible manner. It incorporates whatever performance skills and theatrical training the participants can bring to it. After the workshop, KETEP participants are free to perform the play for new audiences, or adapt the play to other environmental problems. 1. Participation: KETEP participants have been members of theatre troupes, nature protection volunteers, students at arts schools or drama departments, and any interested people from the community where the play will be performed. KETEP workshops include amateurs and professionals working together. Stage experience is not necessary, but helpful because workshops tend to be intensive during a two-week period. A local organizer is necessary to liaison with participants and, if necessary, local authorities. 2. Translation: A KETEP workshop begins with a basic English text that the director, participants and local organizer translate and adapt together. Some participants need to have some knowledge of English to facilitate communication with the director. 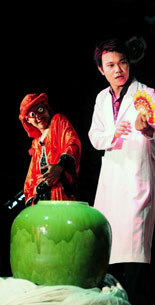 The performance is in the local language for local audiences. 3. Selection of legend or folktale: The selection of a plot is made prior to the KETEP workshop with the input from participants. It should be a story familiar to both participants and audiences. 4. Selection of environmental problems: Ideally, the environmental target is suggested prior to the KETEP workshop, and is already integrated into the script. 5. Rehearsal and Performance Space: A KETEP workshop requires space for rehearsal and ideas for where the initial performance can take place at the end of the workshop. It can be a school classroom, studio, theatre, or a room in a community center. The performance can take place inside or outside, on a stage or in a hall, or any community gathering place permitted by local authorities. 6. Method: Once the script is translated and rehearsal has begun, the individual talents and skills of the participants are integrated. Costumes, props and set requirements are kept to a mimum and created from whatever is available. KETEP performances depend upon innovative scripts, improvised humor, familiar performance traditions, and lively acting, rather than lavish costumes and set. 7. Performance: KETEP workshops culminate in free public performances. The play can be staged as many times as the participants want, in as many venues. All participants are free to re-stage the play whenever or wherever they like. They are also free to make changes in the script. All scripts are available for anyone to use. Please contact Catherine Diamond: ketepinro@gmail.com. 8. Time: KETEP workshops are from 1 to 2 weeks, depending on the schedules of the participants and how much time they can devote to the project. 9. Finances: KETEP is a voluntary activity. Participants are not be paid, nor do they pay for the workshops. Both national and international funding institutions are contacted for basic financial support. KETEP has a small grant for production expenses.